We were the first in the state of Florida to offer statewide bee removal services and your best bet for reliable results. It might seem reasonable that Florida Beekeepers would be responsive to your request to remove honey bees. The reality, however, is that most beekeepers prefer to spend their time harvesting honey and managing the colonies they already have. 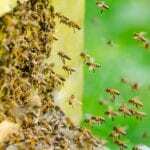 Here at Florida Bee Removal we have become the exception, as we devote our energy full-time to bee removal across the state of Florida, having become the first company to do so. Florida Bee Removal also manages other stinging insects such as wasps, hornets, and yellow jackets. We have the expertise to handle bee and wasp removal from all types of structures, Including trees, containers, walls, and other hard-to-get-at locations. When you call upon us, you benefit from our more than 57 years of experience and a company that trained others entering the industry. When you want your home or business property in the hands of the leader, think of us first! Our goal is to protect your property and the people on it – and we’re confident you’ll be satisfied with the results.